Most real data sets contain atypical observations, often referred to as outliers. Their presence may have a negative impact in data modeling using machine learning. This is particularly the case in data density estimation approaches. Manifold learning techniques provide low-dimensional data representations, often oriented towards visualization. The visualization provided by density estimation manifold learning methods can be compromised by the presence of outliers. Recently, a cartogram-based representation of model-generated distortion was presented for nonlinear dimensionality reduction. Here, we investigate the impact of outliers on this visualization when using manifold learning techniques that behave robustly in their presence. Tosi, A.; Vellido, A. 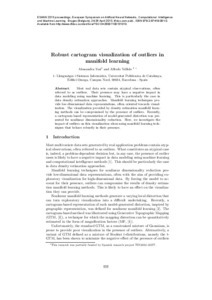 Robust cartogram visualization of outliers in manifold learning. A: European Symposium on Artificial Neural Networks, Computational Intelligence and Machine Learning. "ESANN 2013 proceedings: European Symposium on Artificial Neural Networks, Computational Intelligence and Machine Learning: Bruges (Belgium), 24-26 April 2013". Bruges: 2013, p. 555-560.